After following WYLIE DESIGN GROUP for two decades, Chet contacted Tom to discuss the ultimate pilot house. He wanted an elegant design that would accommodate the vertically superior; Chet and his boys are over 6’6”! The pilot house design for Watts Up meets this challenge and echoes the clean lines and functional layout of Saga and the Baylis. The design/build process ultimately lead to a friendship between Chet and Tom. A real highlight for Tom was going with his daughter to see Chet’s son, Adam, play basketball. Chet was rooting for Adam on the Ducks, and Lindsay was rooting for her home team, the Cal Bears. By the late 90’s, Dr. Michael Katz owned all the WYLIECAT designs: the 17, 30, and 39. 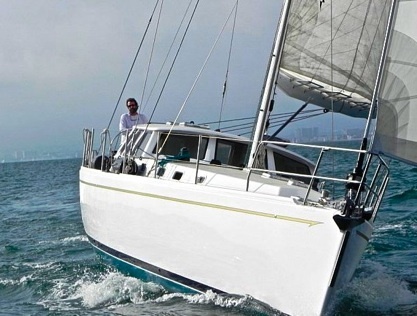 After a double-handed race to Hawaii, he decided to commission a larger version of his 39’ Sabra. 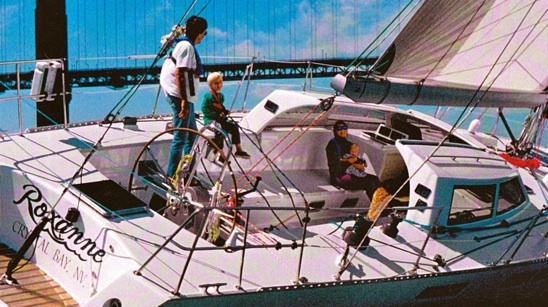 Before Michael acquired Ahava, he took Sabra out on the San Francisco Bay 2-3 times a week. That’s 100-150 times a year, probably a world record! After a year and a half of work, Skip launched Wildflower on Halloween, 1975. 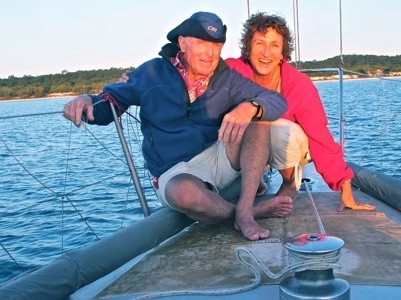 In the following three plus decades, this man-boat duo traveled north to Alaska, south to New Zealand, and many times west to Hawaii. 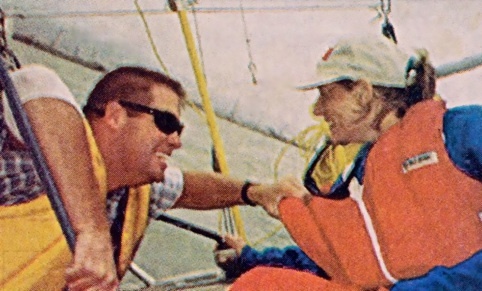 In 2002 Skip and Wildflower were 1st overall and 1st double-handed in the Pacific Cup. All told, Skip and Wildflower covered 100,000 miles. 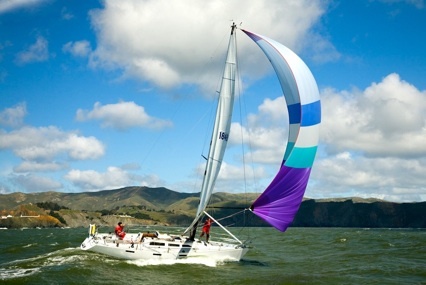 In 2008, after a decisive 1st place in the single-handed race to Hawaii, Wildflower was sadly abandoned in a great gail off the coast of California. This tragedy was extremely painful for Skip and Tom. In spite of the loss, Tom looks forward to many more successful collaborations with his long time ocean-racing pal, Skip. Jonathan Livingston, being a architect, did many drawings of his boat and put on some of the finishing details. Aboard Punk Dolphin, Bird has won many local races and cruised as far as New Zealand. He also won the Pacific Cup and did the coastal race from San Francisco to Santa Cruz with Tom and his daughter Lindsay. Tom had the great honor of designing this wicked fast cruiser for his life-long friend and sailing mentor, Commodore Tompkins. During the early 90’s, the two spent many late nights conferring. Once the design was completed, Commodore started construction at Westerly. With a keen eye and his signature hat, Commodore put the final touches on Flashgirl against the backdrop of a friend’s family farm. The founder of West Marine, Randy Repass, regularly visited WYLIECAT during the construction of the Baylis, a 65’ cat ketch research vessel. 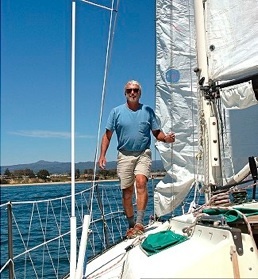 Nine months later, Randy proclaimed, “Tom, you will design my family ocean cruiser with the same hull, rig, and pilot house, Westerly will build it, and my family will help you complete the Baylis.” Over the next few years, the Repass family became an invaluable partner of the Baylis program, and achieved their dream - Convergence. ER Doctor, Tom Petty, was looking well into the future when Tom met him in the mid 90’s. He wanted the reverse sheer and sweet handling characteristic of his Moore 24’ but 60’ long. He also wanted to help in the construction process and work alongside Jim Betts in his shop. During the early 1990’s Tom became aware of a common desire among sailors. They want to sail fast at the drop of hat, with or without crew. This design challenge led to the WYLIECAT solution. Combining state-of-the-art composite technology with the time-proven cat rig, Tom was able to simplify performance sailing and maximize fun. Mustang Sally turned many heads with her winning ways. After her launch in the Spring of 1992, she sailed a double handed Pacific Cup and blew out the English competition. 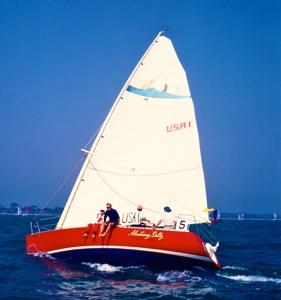 Bill was thrilled to report to Tom that, in England, Mustang Sally was know as “The Little Red Devil of Cowes Race Week.” Please visit the WYLIECAT website to learn more about Mustang Sally and her many sisters. Bruce yearned for the the ultimate singlehanded challenge: to race non-stop around the world in the Vendee Globe. The gang at Schooner Creek, together with WYLIE DESIGN GROUP and some of Bruce’s rigging clients, chipped in to help Bruce achieve his mission. 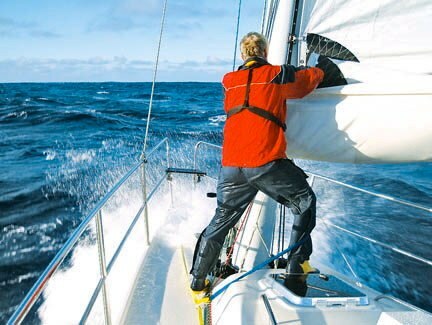 Ellen MacArthur christened OceanPlanet, and in 2005, Bruce became the first American to finish the prestigious Vendee Globe in his Wylie Open 60’. 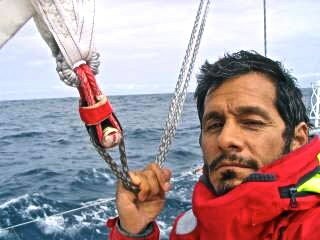 In addition to completing the Vendee Globe, Bruce competed in Around Alone and many other events. Moreover, Bruce founded the OceanPlanet Foundation to “provide inspirational and empowering classes and programs on the water through direct access to OceanPlanet.” To learn more about Bruce and his adventures, please view the OceanPlanet Website. Chris Gibbs wanted to recapture the freedom he lost when he was paralyzed from the waist down in a bicycle accident. After looking at several designs, Gibbs decided to go with a WYLIECAT 39 because “it is a hotrod, easy to operate, and is relatively inexpensive.” Tom and Dave Wahle worked intimately with Gibbs to make Checkered Past a fast and safe boat. Some of the modifications included: a wheelchair accessible swim step, a swiveling race car seat to facilitate steering, and an elevator that allows the boat wheelchair to go up and down the companion way. 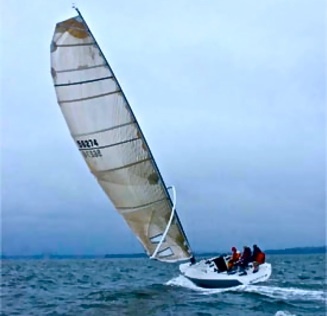 The free-standing carbon mast with a massive sail, combined with the sleek compound curves of a rocket-narrow hull makes C2 a one of a kind boat. Such a boat requires an imaginative client. Charles Ray, world class sculptor and UCLA professor, brought the concept of the WYLIECAT 44 to life with the launch of his beloved C2. C2 is the hallmark of simplicity. She glides effortlessly on the ocean plane and is revered as sculpture by Charlie. This elegant boat was awarded The Most Innovative Design of 2006 at the Annapolis Boat show.